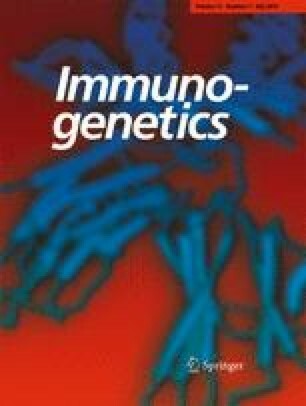 We cloned and analyzed the gene (IGHG3) encoding cattle IgG3 using a spleen cDNA library and a genomic phage clone. IGHG3 differs most remarkably from IGHG1 and IGHG2 in the structure of its hinge. The IGHG3 hinge is encoded by two exons, one of which encodes a 22 amino acid 3′ extension of the CH1 exon. The IGHG3 gene is highly homologous to the C-gamma pseudogene previously reported. Seventy-one DNA samples from different cattle were tested by pulsed-field gel electrophoresis and Southern blot to detect genetic polymorphisms. This analysis revealed two different alleles which we designated IGHG3 a and IGHG3 b . The two putative alleles differ from each other by a 6 amino acid substitution in the coding region and an 84 base pair insertion in the intron between the CH2 and CH3 exons. Our data also indicate that the cattle heavy chain locus spans approximately 400 kilobases from IGHM to IGHA and encodes only three IgG subclasses, all of which are transcriptionally active.